Munich - Half an hour before midnight in Tokyo on Saturday, many a local citizen will be tuning with heightened interest into events almost six thousand miles away as the afternoon action in the Bundesliga gets under way. Above all, football fans in the capital and elsewhere throught Japan will be absorbed in Eintracht Frankfurt’s meeting with 1899 Hoffenheim, a game likely to feature a potential Japanese match-winner on either side. In the home corner, has been taken to the hearts of not only the Frankfurt fans after an inspirational first half-season in the Bundesliga. After Alexander Meier, currently second-top of the Bundesliga scoring chart, Inui is Frankfurt’s next guarantee for goals with five strikes in his first top-flight season, looking as he does a dab hand at breaking down some of the best defences in the business. Bundesliga 2 rearguards had already discovered, predominantly to great cost, how strong the 24-year-old is at striking from a deep-lying position, much the way he did to grab 20 goals on his return to the Japanese J-League with Cerezo prior to his move to VfL Bochum in 2011. Yet his partnership with Meier is showing even greater potential and he may soon eclipse the seven goals he scored in Germany’s second tier last term. 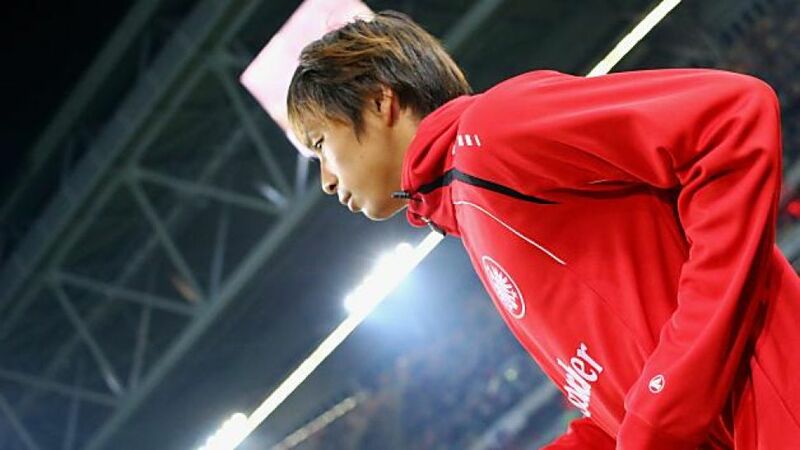 Takashi Usami stands in the away corner, back in the Bundesliga for a second bite of the cherry after an educational year with record champions FC Bayern Munich. After being thrown in at the deep end with Bayern, his move to the province has brought out the best in a man of the very same ilk as Inui, seemingly moulded on another Japanese talent to make a name for himself in the Bundesliga, Shinji Kagawa. Whenever Usami scores, he sets one up too for good measure, apparently unhappy to do things by halves. Unsurprisingly, Hoffenheim’s biggest win of the season, a 3-0 triumph over local rivals VfB Stuttgart, bears Usami’s hallmark, and that was not the only time he has demonstrated his all-round capabilities. With Hoffenheim’s season struggling to take flight, though, Usami has not enjoyed the same level as service afforded to Inui, but that may change now the club have signed coveted midfielder Afriyie Acquah from Italian club US Palermo. “Despite his young age, Afriyie Acquah has the class and, above all, the will to help Hoffenheim take a decisive step forwards,” said the club’s general manager Andreas Müller. “In addition, he plays in a position which, due to the loss of many players, we really needed to fill.” The Ghanaian international comes backed with the experience of 44 games in Italy’s Serie A, and he has signed a contract until June 2017. With the other new arrival David Abraham, there could be two new faces in the Hoffenheim side this Saturday.